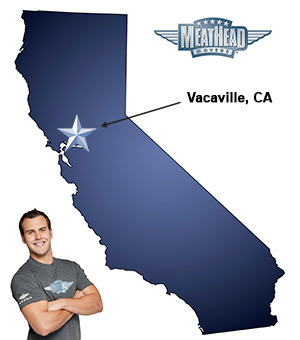 Meathead Movers is here to take care of the heavy lifting for you on your move to Vacaville. Our clean-cut student athlete movers are ready to get you safely settled into your new Vacaville home. If you are moving to or from anywhere in Vacaville, we are the moving company for you! Our professionally trained student-athlete movers and our moving concierge service are here to help you with every stage of your move. Located in northern Solano County, halfway between San Francisco and Sacramento, the city of Vacaville is a gorgeous area surrounded by beautiful hillsides, orchards, and fertile farm lands. Since its humble beginnings as a small agrarian town, it has grown into a thriving city with a strong sense of community. With many parks and a wide range of community events, activities, and recreation programs, this city offers fun for the entire family. If you enjoy art, the Vacaville Performing Arts Theater has a wide range of art and entertainment opportunities. For those who enjoy a more natural view, Lagoon Valley Park offers scenic views and great fishing and hiking opportunities. Residents can also enjoy a stroll along the beautiful Creekwalk, ice skating, or fine shopping and dining in the historic downtown district. Visit the historic Nut Tree, California’s legendary road stop for shopping, dining, and the famous Nut Tree Railroad. If you are considering a move to the area, Meathead Movers is here to help! Our moving company specializes in local, long-distance, and commercial moves. We also provide reliable packing, storage, on-site relocations, and our distinctive moving concierge service, which connects you with local service providers. All our student-athlete movers are thoroughly screened and trained before their very first move. With branches not just in Vacaville, but all throughout California, we are your one-stop resource for all your moving needs. Read our reviews for yourself to see what your neighbors have to say about us! We are so confident in our services, that we even offer a 100% satisfaction guarantee! So, what do you have to lose? Contact Meathead Movers today for a free no-obligation moving quote, and learn how we can help you on your next move! Moving to Vacaville? Here are some helpful resources.